I am just getting started with this new blog and so beginning to learn how to set up this template. It is fairly new to me, but it seems straight forward.. Unfortunately, I do not have a lot of time to devote to this task at the moment as I want to publish two books before the end of July, which gives me four days – not long at all. 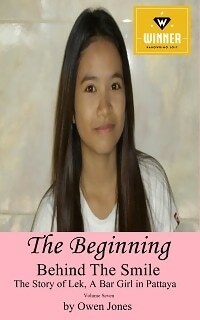 One will be the final book in the trilogy called ‘Behind The Smile – the Story of Lek, a Bar Girl in Pattaya’ and the other is ‘Megan’s Thirteenth’ in the Megan Series, so I will be posting more about that later. Sunday 28th July, Afternoon: I have spent the last hour adding a few plugins to my WP template and activating them. One was Facebook another Tweets old post (not that I have any yet) and another has added links to some of my books. SUNDAY evening: I have finished rereading ‘Maya – Illusion’ and am ready to publish on CreateSpace and Kindle! I published on CreateSpace, but I had already done a lot of preparatory work last week. The cover and the blurb had already been written and the author bio was the same as before. Then I did the same for Kindle, but Kindle reported errors using basically the same file that I had used for CS! It seems that the conversion from OpenOffice to Word had created about 30 duplicate words! (Or that OpenOffice had not picked them up, but I doubt that very much!). I may have to redo the CS edition. In fact, I had better be getting started on that right away, but Kindle is all right! If you want help getting started with the publishing or the preparation of your files, please let me know. PS: If you want help getting started on bringing your book out into the light, leave a message in a comment box – they are all regulated by me bore publication anyway.